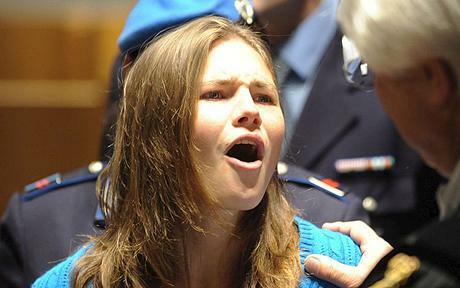 Amanda Knox: The story of Amanda Knox’s release from prison in Italy dominates the news. But the coverage isn’t just about the court’s decision, her reunion with her family or flight back to Seattle. What’s next for this young woman who went to Italy her junior year of college and ended up in prison for four years? We’re told she spent much of her time in the Italian prison writing and that she’ll likely write a book. One news report said that she wants to help others wrongly imprisoned. We’ll see how the trauma of her last four years — and the fame she didn’t ask for — defines her future. 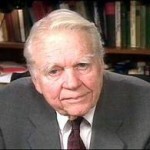 Andy Rooney: At 92 years old, Andy Rooney delivered his last commentary on this past Sunday’s “60 Minutes.” Mr. Rooney was almost always sarcastic and on occasion his humor had a nasty overtone, but he was always, always, always a consummate observer of life. He noticed everything and wondered why things were as they were. I often watched his commentary and thought to myself, “Exactly!” And, yet, somehow I hadn’t stopped to notice in the moment. The excuse is always that we’re too busy. 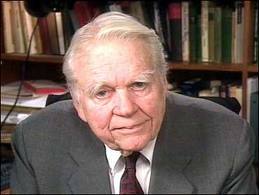 Reflecting on Andy Rooney’s years of commentary during the Jewish holidays made me think about a quote from Moses, “Stand still and see!” Andy Rooney and Moses actually make the same good point! And each year the question is relevant for me. What will I notice, think about and do? I just have three things to say to the Monday morning critics of the preparation for Hurricane Irene. Hindsight is 20/20: We saw what happened when we underestimated the impact of Hurricane Katrina. It was impossible to mobilize the needed support after the fact. 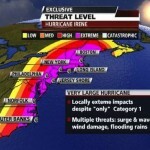 Leaders in the East coast cities and states along Irene’s path weren’t willing to risk waiting. Two cliches pop into my mind, “Hindsight is 20/20,” and “Better safe than sorry.” Cliched but never more relevant. Predicting the weather is only part science. How many times have we (in the Northeast) been surprised by a snow storm that wasn’t anticipated that turned highways into parking lots? Or, as we experienced with Hurricane Irene, by storms that were forecast as record-breaking that passed through with less damage than predicted. Not no damage…just less damage. Thankfully Hurricane Irene didn’t live up to expectations in New York and Boston, but that’s little comfort to the people whose loved ones lost their lives, or the coastal communities that were flooded, or the neighborhoods without power because of downed power lines, or the peoples’ homes destroyed by massive uprooted trees that were no longer able to stand tall in already saturated ground. In a time of epic natural disasters, we are reminded of the sheer power of Mother Nature. Grotesquely large hurricanes, earthquakes in our major cities, record-breaking tornadoes, and a year of unprecedented droughts and floods. Reminders that we are just mere mortals. 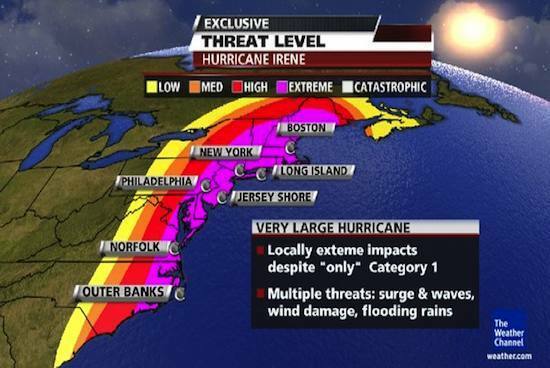 And I have only one thing to say to the leaders who took the risk of over-preparing for Hurricane Irene. Thank you. I hope you show the same conviction the next time when we will still have to rely on flawed science, history’s lessons and a healthy respect for Mother Nature. It’s an understatement to say that these are tough times. It’s painful to read the newspaper each morning and watch the news at night. Our government failed to govern, a very few extremist legislators usurped the will of the majority, we thought we’d narrowly escaped a financial crisis caused by defaulting on our nation’s debt only to witness a horrifying drop in the markets and the shameful implications of being downgraded by a ratings agency. The global economies are so tied together that a financial crisis in Europe or the United States has staggering impact everywhere. Our president — who I so desperately want to successfully lead our nation back to security, prosperity, jobs and more reasonable dialog — repeatedly demonstrates how not to negotiate. As a progressive Democrat, it was hard to watch President Obama completely give up on raising revenue along with cutting spending as the debate got tough. It’s not negotiation when only one side compromises in any significant way. The financial crisis has the potential to dominate our thoughts but then we’d miss noting the presidential hopeful talking about our “Christian nation.” What happened to separation of Church and State? The United States of American isn’t a Christian nation, nor a Jewish or Muslim or Buddhist nation. That’s the point! And still, more horrifying than the frightening mess facing our nation is the staggering famine in Somalia and the world’s inability to get food to the starving. How can we — in the year 2011 — merely watch the devastation, powerless to help because of the armed and violent thugs who steal the food, kill the hungry and claim there’s no food shortage. And in this morning’s, Boston Globe, I read about three fifteen-year olds in a New Orleans suburb who were plotting to shoot fellow high school students during the first day of classes. But…we’re told that guns aren’t a problem. 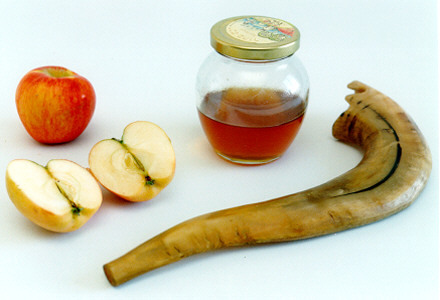 These are tough times around the globe and I feel so fortunate that my family and friends are all safe, secure and well-fed. Still…sometimes this liberal optimist just feels like screaming! 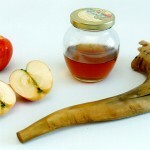 Do we standby and merely witness or do we get involved? How can we each personally — and then collectively — take responsibility for improving our condition in the world, at home and at work? These are tumultuous times. The world watches as Japan is devastated by earthquake, tsunami and nuclear power plant failures and radioactive leaks. The world watches as people revolt, in Egypt, Tunisia, Yemen, Bahrain and Libya. Our economy struggles to recover, yet remains so fragile that world events such as the flow of oil from Libya and the industrial uncertainty in Japan shake investor confidence. While still thinking about the rally, I read Seth Godin’s blog, Idea Tourism. “Idea Tourism” urges us to actively engage in our life’s experiences, to participate vs. just pass through. Taking responsibility in Japan: worldwide expert counsel and rescuers, and individuals sending desperately needed financial support. Taking responsibility back home: the budget crisis has sparked individuals and groups to get involved, to stand up to ensure that budget cuts are compassionate, balanced and compelling vs. knee-jerk, self-serving and politically motivated. 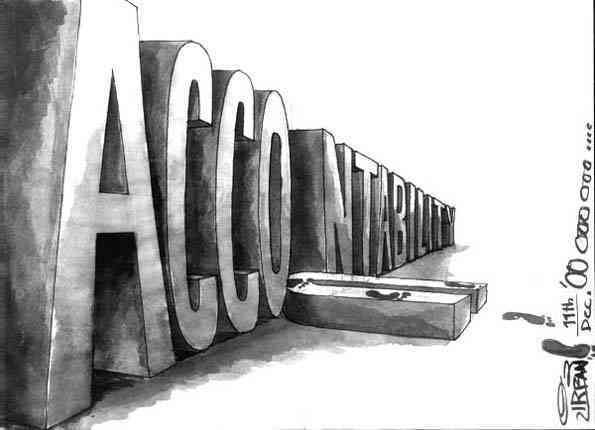 Taking responsibility in the workplace: managers and employees are taking responsibility, to add value, to help their companies save money, and ultimately to help create jobs so that more Americans can pay their mortgages and feed their families. 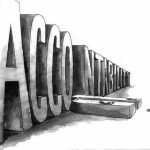 Managers and employees need to hold each other accountable for doing things differently. These are tough times, and we all need to consciously live the mantra, “not on our watch.” What will you take responsibility for making happen? What negative outcome can you help prevent? Without passion, leaders, managers and spokespersons fail to inspire. If people can’t see how much you care, why should they care? I coach individuals to communicate their passion and conviction. And yet…my 20-year old son is helping me understand how passion can sometimes paralyze instead of persuade. As a very political individual with strongly held beliefs, values and opinions, these mid-term elections have absolutely consumed me. I screech at the TV during the non-stop political ads. I grunt to myself as I read the latest polls and pundits’ predictions. I’ve started to rant in political discussions with people who hold different opinion and even like-minded friends find the temperature of my discourse far too hot. I’ve now taken that dangerous step beyond passion. It’s almost as if this usually reasonable communication expert temporarily has a sign on my chest that warns people not to approach. My husband and I were invited to dinner this weekend but the host wondered if I’d want to come because she and I hope for different outcomes next Tuesday. My flawed rationale is that I care so deeply – am so passionate – about what I believe that I can’t temper my response. My very wise son observed that if my goal is just to rant I am absolutely hugely successful. 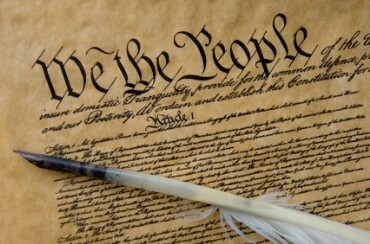 But if my goal is to help persuade others to my political perspective, my all consuming passion is far from effective. Passion together with purpose leads to success. Passion that obliterates another way of thinking poisons any hopes for rational discourse. Successful communication always requires respectful listening…especially when our own passionate positions make it really, really hard to feel respectful or listen. I will try very hard to take a deep breath and engage in passionate but also purposeful and persuasive discourse between now and Tuesday. I celebrated my birthday this week — surrounded by family and good friends. While others might feel daunted by turning fifty-five, or “the double nickel” or “speed limit” birthday, I am good. Really . So why do I welcome each birthday (still), when other people…well not so much? When I turned fifty, my daughter and I started creating rhyming tag lines for each of my birthdays. “Nifty at fifty.” “Fifty-one and still having lots of fun.” “Fifty-four and ready for so much more.” We haven’t found one we really like for 55. We’ll continue to look for the tag line that best matches how I feel. Happy. Proud. Wise. Blessed. Excited. Confident. Experienced. Accomplished. Open to learning and discovering. Delighted by new experiences and new people. I’m less tolerant of fools and and have no patience for small-minded people. I am absolutely certain of my values and beliefs, but recognize that my perspective will continue to evolve. While I still tend to describe myself as middle-aged, that’s probably no longer true because I’m not really sure I’ll be celebrating my 110th birthday. But there’s really no description that works for me. Maybe “maturing baby boomer” but that feels more like a demographic category for marketers than a description of where I am in my life-cycle. I’m a member of a small “mastermind” group of professional women and we inspire one another with new ideas, opportunities and possibilities. Our already successful careers absolutely are not yet fully-baked despite our collective experience and expertise. As my baby applies to college, and my oldest is already there, my husband and I prepare to be empty nesters (another consumer label). We know we’ll really miss our kids, but we’re beginning to plan our post-kids fun — like a cruise through the Panama Canal next year (that doesn’t have to take place during a school vacation week). Is 55 the new 40? Do I wish I could go back in time? Nope. I love where I am and who I am today.